Concord, a city and the capital of New Hampshire, and the shire town of Merrimack county, situated on the Merrimack river, about 45 m. from the Atlantic coast, and 60 m. N. N. W. of Boston. The Merrimack divides the city N. and S., and the Oontoocook winds along the W. half of the N. border. At their confluence is a small island, famous as the place where Mrs. Hannah Dustin and her nurse, Mary Neff, with the aid of a boy, in 1697 killed ten Indians who had taken them captive from Haverhill, Mass. The main part of the city is situated on the W. side of the Merrimack, and is well laid out. The streets are shaded with elms and maples. Fisherville, a village near the junction of the two rivers, lies chiefly in Concord. Millville, a small village 2 m. S.
W. of the state house, is the seat of a school for boys. The Merrimack is bordered by wide intervales, which are overflowed by freshets. Four railroads centre in the city, viz. : the Concord, connecting with Nashua, Lowell, and Boston; the Concord and Claremont; the Northern, connecting with Lebanon; and the Boston, Concord, and Montreal, with Plymouth and Haverhill. The population at decennial periods has been as follows: in 1810, 2,398; 1820, 2,838; 1830, 3,702; 1840, 4,903; 1850, 8,584; 1860, 10,896; 1870, 12,241. The state house was erected in 1816, costing $80,-000, and rebuilt and enlarged in 1866, at a cost of $175,000. It is of granite, hammered by the convicts in the state prison, which is located in the city. It stands in a beautiful park ornamented with shade trees. The centre of the building is 50 ft. front by 57 deep; the wings are each 38 ft. front by 49 deep; the whole making a parallelogram 126 ft. in length by 49 in width, with the addition of a projection of 4 ft. in the centre of each front. 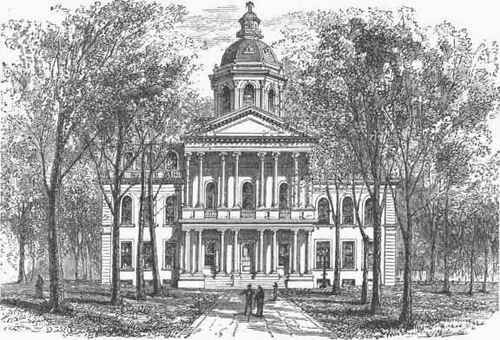 The state asylum for the insane stands on an eminence about half a mile S. W. of the state house. The buildings are of brick, and are well adapted to the purpose. A large farm is connected with the institution, and a considerable portion of the provisions needed for the inmates is produced by the labor of those able to work in the field. There are usually from 225 to 250 inmates. The city hall is a large brick building. Water works, costing about $200,000, were constructed in 1872, and the city is now supplied with pure water from Long pond, 4 m. from the state house, and 120 ft. above Main street. Extensive quarries of beautiful white fine-grained granite exist on the line of the Concord and Claremont railroad, within the city limits. Large quantities, cut and uncut, are shipped to Boston, and thence are exported to southern ports for building purposes. Great water power might be furnished at Sewall's falls, in the Merrimack, 2 m. above the business centre, and at Garvin's falls, 2 m. below. At Fisherville there is also great motive power, partially improved by manufactories erected in Concord and the adjoining town of Boscawen. The city is especially noted for its manufacture of carriages, which are largely exported. There are 120 manufactories of various kinds, employing steam engines having 720 horse power, and water wheels with 734 horse power; capital, about $2,000,000; number of males employed, 1,800, and of females, 350; wages annually paid, $1,000,000; value of products, $3,616,000. The value of the most important articles produced in 1870 was: carriages, $550,000; cotton goods, $250,000; woollen goods, $230,000; leather and leather belting, $300,000; foun-dery products, $250,000; granite, quarried and dressed, $350,000; furniture, $350,000; reed organs and melodeons, $60,000; harness, $150,-000; lumber, $90,000; boots and shoes, $100,-000; clothing, $150,000; marble, worked, $60,-000; products of railway repair and car shops, $300,000; of printing and bookbinding establishments, $150,000; of silversmithing establishments, $75,000. There are also manufactories of sashes, doors, and blinds, of silver-plated ware, of steel carriage springs, etc. Concord is an important centre of trade, possessing two banks, with an aggregate capital of $350,000, and about 250 stores, with a stock in trade valued at over $800,000. The total valuation of the city is upward of $11,000,000. The public schools in 1872 numbered 25, including a high school, with 30 teachers and 1,295 pupils. The public library contains 6,223 volumes, the state library 11,000, and that of the New Hampshire historical society 6,500. There are two daily and three weekly newspapers, and 16 churches. - Concord was originally the seat of the Penacooks, a powerful tribe of Indians. Passaconaway, a sagamore and a friend of the English, resided here. It was settled in 1725, incorporated under the name of Rumford in 1733, and under its present name in 1765, and made a city in 1853.